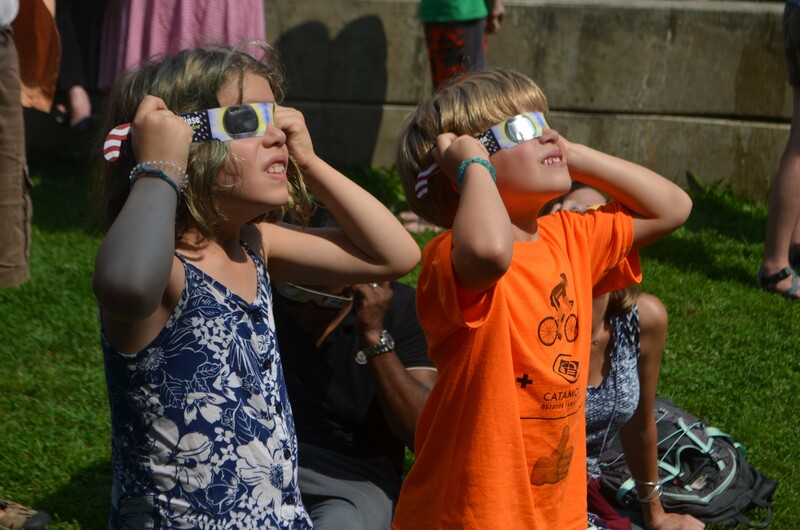 The lawn outside of the Fletcher Free Library in Burlington was bustling with people by the time the moon had taken just a nibble out of the sun Monday afternoon. 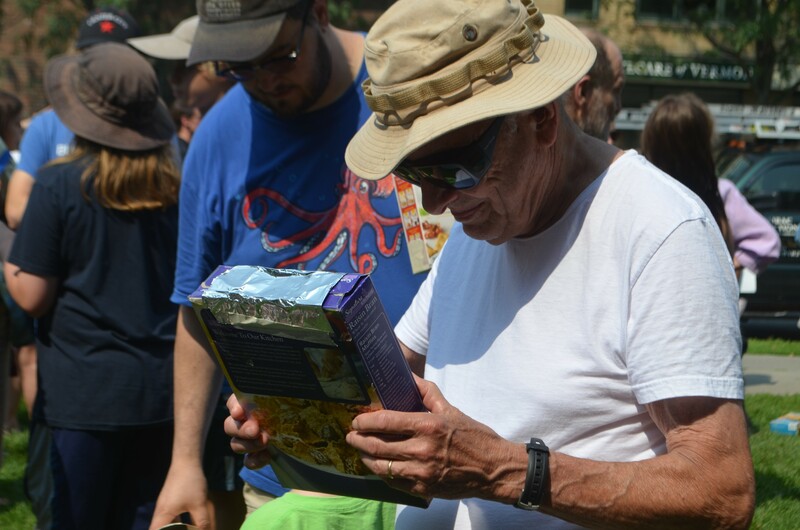 Elderly couples sat in lawn chairs, babies rested on picnic blankets and Vermonters of all stripes turned their faces skyward to get a glimpse of the solar eclipse. By the time it peaked at 2:40 p.m., library staff estimated that between 400 and 500 people had gathered on the grass for the spectacle. The intersection of moon and sun marked the first total solar eclipse visible from the United States since 1979. At its peak in Burlington, the moon covered about 60 percent of the sun. Monday's event at the library was part social gathering, part elementary school-style science experiment. Attendees came with all manner of viewfinders: cereal, cracker and shoe boxes. They used colanders to reflect the light, or balanced their special eclipse glasses on contraptions involving binoculars or cameras. 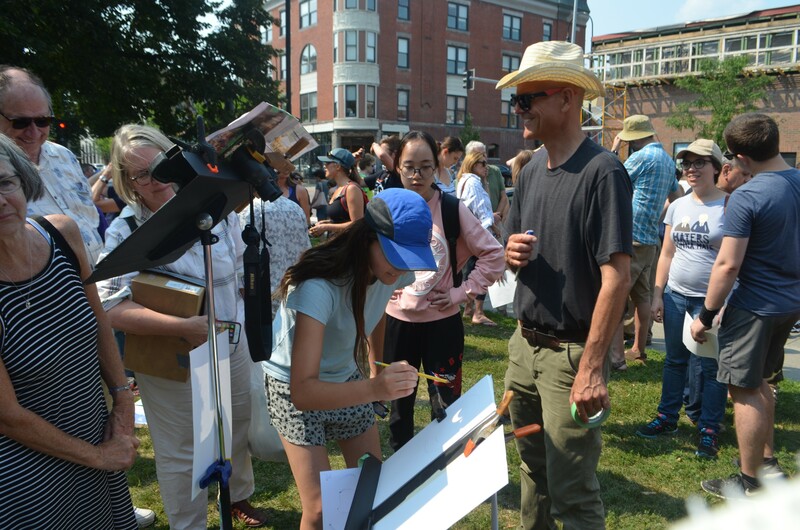 Old North End resident Brian Perkins clipped a pair of binoculars to a music stand so it reflected the shape of the sun in two spots on a piece of paper. Volunteers traced the pair of suns and added a nose and mouth, creating a face that changed by the minute. As the eclipse advanced, the faces changed from wide-eyed surprise around 1:50 p.m. to a squinting, evil cackle at 2:33. Perkins set up the experiment "for fun" and to allow everyone to participate. "It's good community-building," he said. "Much better than staying in your backyard," someone else chimed in. At a table in front of the library entrance, Megan Butterfield, who works in the library's youth department, handed out low-tech pinhole viewers — five pin holes on one sheet of printer paper that allowed the light to shine through and reflect the shape of the sun. Strangers shared eclipse glasses. Burlington Mayor Miro Weinberger made his rounds. Kids and adults alike joined in to count down the ten seconds leading up to 2:40 p.m.
And just like that, the crowd dispersed. "It was better than we expected," said library director Mary Danko as the flurry died down. The library ran out of lemonade and eclipse glasses. And the free moon pies? "They went like hot cakes," Butterfield said with a laugh.